CLiPtec BME820 Dual Dynamic Drivers In-Ear Earphone with two 9mm dynamic drivers in a single earphone; it even uses frequency division technology to output bright treble and deep bass respectively. 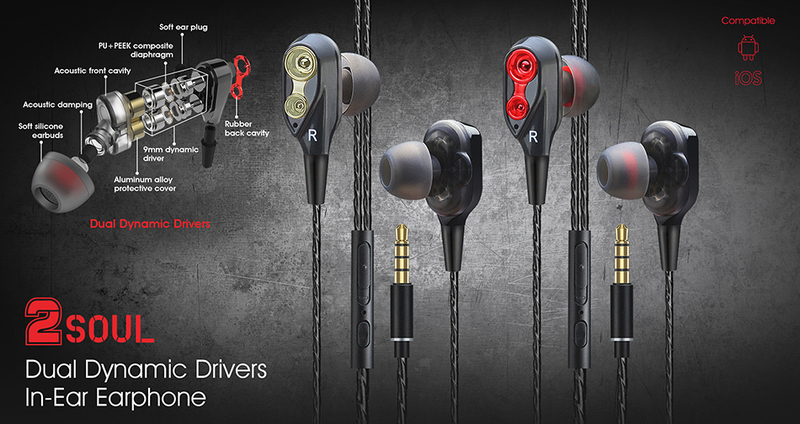 Therefore, the dual dynamic driver earphone not only adds a speaker on the ordinary earphone, accordingly it produces a shock effect comparable to that of the balanced armature driver earphone in the sound quality. The microphone and volume control in-line design also provides easily switch between making calls and listening to music with smartphone directly. The TPE wire material is to perform the quality and stylish of this earbud. Dual 9mm dynamic driver units produce Hi-Fi audio well-balanced of strong bass, soaring highs, and clear Mods. 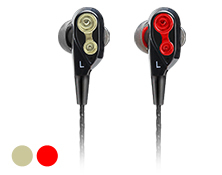 Produces a shock effect comparable to that of the balanced armature driver earphone in the sound quality. Controller allows users to answer and end calls & control music volume or video playback. Comfortable shape that stays securely on and provide noise isolation or minimize bass leakages. Extra 2 sets of soft silicone ear caps are included for personalized comfortable purpose. The special ultra-durable twisted TPE cable is anti-sweat function and anti-stretch to perform for daily use. 3.5mm audio jack for premium and no-loss sound connect to your audio device. © 2017-2018 CLiPtec Creative Lab Inc.